Middletown....Jay Dee Manis, 53, resident of Middletown passed away August 19. 2018 at St. Vincent's Regional Hospital in Anderson surrounded by his family and friends. He was born September 4, 1964 in Muncie, the son of Joe and Jill Campbell Manis. He was a 1984 graduate of Shenandoah High School. He had worked in the factory most of his life. 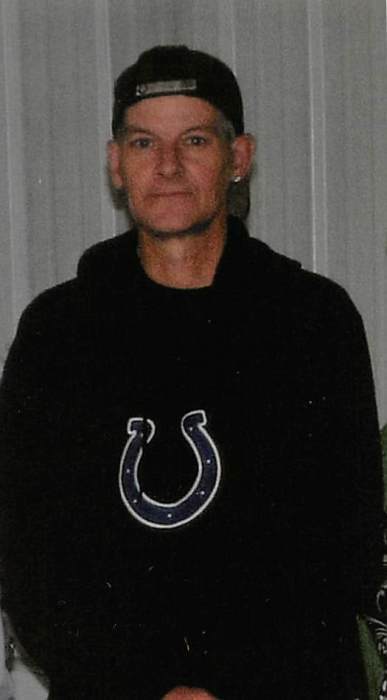 He was a fan of the Indianapolis Colts and loved baseball hats. Besides his parents, he is survived by siblings: Jodi (David) Hamm, Julie (Bill) Hohlt, and Janis (Billy) Walker, nieces and nephews: Chase Criswell, Cory (Sabrina) Criswell, Alli and Abbi Criswell, Ivy Walker, Sophie Walker, Kindle and Will Hohlt, Luke (Amanda) Hamm and Ruthie, Dylan (Kirstyn) Hamm, Aunts and Uncles: Jack and Nancy Campbell, Joyce and Larry Hanson, and Jerry and Beverly Manis., cousins: Jill Pugsley, Teddy Campbell, Stacey Hanson, Angie Beck and Dale Manis. He was preceded in death by his maternal grandparents: Doc and Dene Campbell, Paternal grand parents: Ivan and "Bibs" Manis and cousin: Jeff Campbell. Services will be Wednesday at 2:00 PM at Ballard and Sons Funeral Home, 118 South 5th, Middletown with Pastor Jeff Johnson officiating. Friends may call one hour before the services on Wednesday.. Please wear your favorite colts shirt, baseball hat, or checkered van shoes. Memorials may be made to the Cadiz Christian Church BLOC.